At the age of twelve Lina is graduating from school and is eagerly waiting to find out what line of work she is going to be assigned to. She is horrified when she is given a job in the Pipeworks. She cannot imagine a worse future and is therefore delighted, and relieved, when a school mate - Doon - offers to trade jobs with her. Now she will get to be a messenger, the very job she always wanted. Though she is delighted at her good fortune, Lina cannot help absorbing the worry that lies in the hearts of the people who live in the city of Ember. Ember is a dark and cold place, a place dependent on electric light, for there is no sun, no moon, and no sky - there is just a blackness which encloses the entire city. These days the light is beginning to show signs of failing - the blessed light bulbs flicker and go out a great deal. Unfortunately no one in Ember has the know-how to fix the problem for no one really understands the machines that create the electricity that they need so desperately. Are the people doomed to die in darkness when the machines finally give up and break down for good? Lina makes a discovery and with Doon’s help she tries to find a way to save the people of the dark city. Jeanne DuPrau has created a novel which is gripping, full of unexpected outcomes and which leaves the reader clamoring for more. 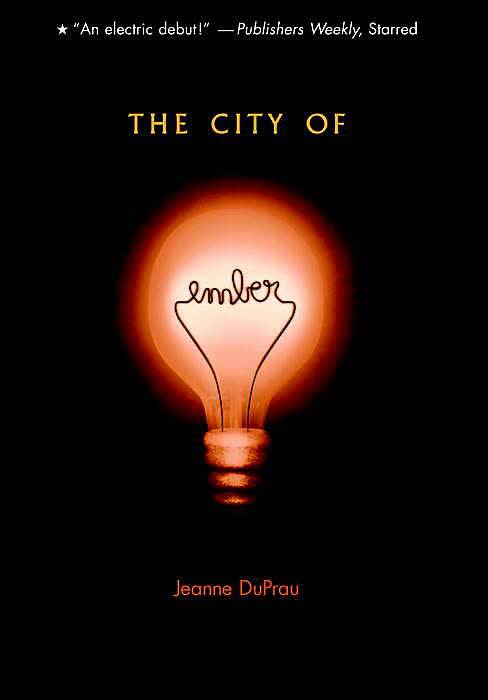 With vibrant and sympathetic characters who live in a bizarre and puzzling world, "The City of Ember" will delight readers of all ages.